In more than twenty-five years of writing and ministry, Max Lucado has received thousands of such questions. They come in letters, e-mails, even on Dunkin Donuts napkins. In Max on Life he offers thoughtful answers to more than 170 of the most pressing questions on topics ranging from hope to hurt and from home to the hereafter. Max writes about the role of prayer, the purpose of pain, and the reason for our ultimate hope. He responds to the day-to-day questions?parenting quandaries, financial challenges, difficult relationships?as well as to the profound: Is God really listening? A special addendum includes Max's advice on writing and publishing. 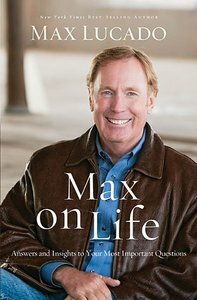 Including topical and scriptural indexes and filled with classic Lucado encouragement and insight,Max on Life will quickly become a favorite resource for pastors and ministry leaders as well as new and mature believers.